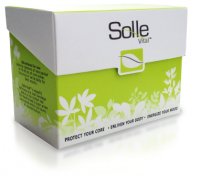 SolleClear SI, 90 capsules - JennScents, Inc.
Purchase this product and earn 40 Reward Points! Learn more. A combinations of herbs to open up respiratory pathways and clear sinus congestion. Specially formulated to boost immunity, combat allergies, hayfever, runny nose, itchy eyes, and other immune and respiratory issues. These herbals are also known to open passage ways for the lymphatic and digestive systems, vein health, eye health and circulation. Contains, but not limited to Suma Root, Bilberry, Eyebright, Fennel, Mullein, Fenugreek, Quercetin, Horseradish and Wasabi.